It takes more than a beautiful pattern to make a great set of stainless flatware! When I first started out having my own apartment as a teenager, I picked out my first stainless cutlery set, and wouldn't you know, I still have it and use it! However, I have discovered that although my flatware has held up for more than forty years, I could have made a better choice in the beginning, and probably ended up buying one less set than I currently have. While I paid very little for that first set, spending a few dollars more probably would have saved me money in the long run. A Fork isn't Just a Fork! Let's face it, we all use cutlery for more than just eating: scraping dishes; cutting up something if all our other kitchen knives are dirty; prying off lids; and many more uses. That flatware is handy and usually right within reach, where our specialized kitchen tools may be farther away. While I encourage everyone to use the proper tool for the proper job, there's no getting around human laziness! However, most of us pick our sets on design alone, and forget about how the utensils in the set will be used in real life. So the next time you are ready to choose a cutlery set, it's best to keep certain factors in mind. Alloy: Stainless sets should be marked 18/8 or 18/10. These numbers refer to the amount of chromium and nickel allowed in the alloy. Anything less than this (especially 18/0) and the flatware will not hold up to everyday use. Note: if you are allergic to nickel, you may want to consider 18/0 and hope to make up for it with the other factors in the list. Sturdiness: Your tableware should not bend, even when considerable pressure is put on it. In particular, test the tines of forks, handles of spoons, and the ends of the knife blades. If any of these show bends, choose a different set. Otherwise, you will be very upset when you are digging out a scoop of hard ice cream, and your spoon handle bends. Edges: Knives should have working serrations. Preferably, tines of forks should be straight, rather than curve inward. Depth: Forks and spoons should have enough depth to pile up food. Spoons should have a sharp enough end to get into the edges of mugs. 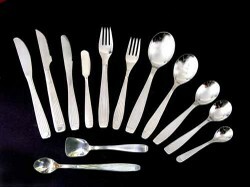 Construction: Molded or injection flatware is better than stamped. Balance and heft: The cutlery should feel good in your hands, and not awkward to use. Finish: Matte holds up better than shiny. Warranty: A good flatware set should last you a lifetime, or close to it. Look for better than a ten-year warranty, and file that receipt safely away in your filing cabinet! While one cannot expect perfection in anything, this set may come closest. The knives are not sufficiently serrated, in my opinion, but everything else about this beautiful set deserves consideration, especially the resistance to bending. It even comes with a 25-year warranty! Now that you are an informed consumer, I hope you will make your next cutlery purchase wisely, and enjoy it for many years to come! Learn about how to care for your ceramic knives, and why special care is necessary to maintain the blade's sharp edge. Knives are one of the most important tools you can have in your kitchen, but you don't need a huge collection of specialty pieces. Here are the basics for any kitchen.